9.12. Ålandsbanken is the new main partner for Tarantella.We look forward to an interesting and successful year with our new partner. 16.10. Results from Sokeri Pohjalla Race have been published. Tarantella secured her win with a rather good margin of 17% in corrected time in this LYS-race. We will participate with this result in the annual and worldwide S&S Association competition of the greatest victory margin in handicap racing with S&S-yachts. 2.10. And once again the Lady is covered up for the winter! This year the covering took about 1,5 hrs! Skipper Leif, foredecker Henrik and guest Tarpaulinist Ari Ansaranta participated in the job this gloomy Sunday afternoon. Check out our achievements this year here. 25.9. Grande Finale for Tarantella this year in the Sokeri Pohjalla 23 nm LYS race on 24.9. The sailing weather was excellent, with nice and warm summer winds despite of the late date. Our helmsman this time was foredecker Juhana Salminen, who did a great job. First place for Tarantella with a considerable margin. The margin was so big that we had time to dismast Tarantella (on purpose, for lifting ashore) before the second boat crossed the finishing line. 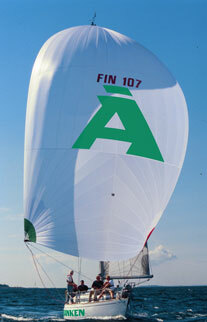 Picture: Henrik controlling the spinnaker. Results are here. Right also the track from the race. Note that the red dots are tack points and the green dots are gybe points. 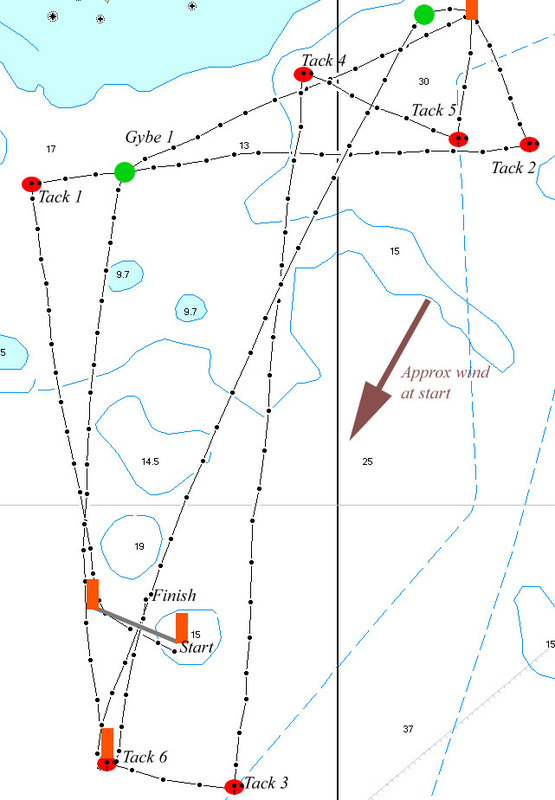 The course length was about 23 nm, while our traveled distance (including tacks and gybes) was about 26 nm. The season is now over. 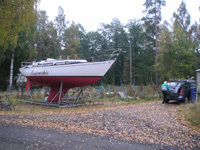 On 25.9 Tarantella was lifted ashore for a well deserved rest unil the next season. Inspecting the keel showed that the Hempel's antifouling had worked well - no slime and no barnackles despite of the high algae content in the Baltic waters. Picture: The mast has been lifted off. See our racing performance for 2005 here. 12.9.2005 Syysseilaus on 11.9 consisted of two starts, one short widward-leeward race of 5,1 nm and a longer archipelago race of 22,1 nm. The wind was quite weak, mostly 4 - 7 knots, which makes great difficulties for a heavy and underpowered boat likeTarantella, in particular on the beating legs. FiftyFun did not show up at all, thus Charlotta, second in ranking, was our primary competitor to follow. In the first race we got an excellent start at the left hand flag and selected the left side, which showed to give good credit compared to Charlotta, who took the right side. We rounded the windward mark soon after Mellow Light and almost 10 minutes before Charlotta. On the way down to the leeward mark Mellow Light was passed, thus all our competitors were under good control. Things looked very promising, but on the second round the wind shifted to the right giving a lot of benefit to Charlotta, who sailed about one leg behind us. We took the shot, but Charlotta finished only 13 minutes after us giving her the first place with 1 minute margin in calculated time. Mellow Light was third and Merinna fourth. On the picture above you see Charlotta (the smaller one!!) bypassing even Two Tonner Touch Down on her way to the finishing line...... Results. In the total scores for the day Charlotta was the winner, while Merinna was second with equal scores for Tarantella. As Merinna was better in the latter race, they were given the silver and Tarantella the bronze. We congratulate both Charlotta and Merinna. Results and pictures. Read Charlotta's story here. Our crew is somewhat astonished over the steeply escalating handicap Tarantella has to give to Charlotta in both beating and running when the wind goes to 8 and 6 knots. 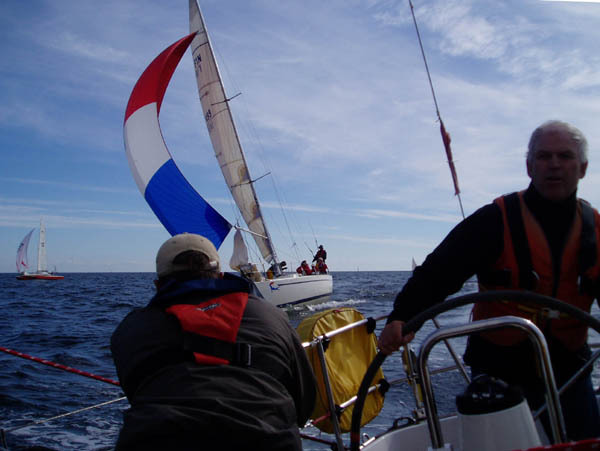 At 6 knots the handicap is close to 4 minutes per mile! This despite the fact that Tarantella is a heavy hard wind boat of similar style with inferior light wind performances. See graph. The size difference between the biggest and smallest boats in IMS 3 class is definitively too big. For the future we should get more smaller boats so that the IMS 4 class could be re-introduced. Charlotta also secured the second place in the ranking. Tarantella stayed third. 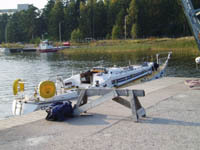 Our final race this year is Sokeri Pohjalla in Kantvik on 24.9.2005. 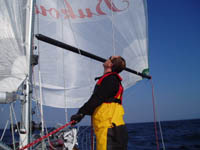 5.9.2005 HenriLloyd Race of 26,1 nm was sailed on 3.9 in summer weather with very variable winds. In the start the wind was below 1 knot, and strengthened during the race to 14 knots. Tarantella took second place after Harald Hanneliu's Charlotta, despite of an excellent race for Tarantella. Charlotta was the winner (also over all) with a large margin, even though they took a false start and had to return back in the light wind. They were less lucky on the first 6,1 nm part, and rounded 17,5 minutes after Tarantella. Their handicap at that point was 12 minutes. After that they seemed to have had an excellent go and took an extra benefit of the strenghtening wind. Third place went to FiftyFun. They also took a false start. We had a nice fighting with Tapani Juva's Minnamari,who saled excellent and we did not leave them until the spinnaker reach in the 14 knots wind to the finish line. See picture. They finished as number four. See results here and pictures here. One reason to the big time differences between Charlotta and Tarantella compared to the others was that the course was calculated with an average fixed wind of 8 knots and PCS. Using a distance weighted average instead of arithmetic average the wind had been at least 10 knots giving surprisingly much smaller differences. See graphs of Tarantella's handicaps to Charlotta, FiftyFun and Minnamari in this race. For Minnamari this 2 knots increase in calculated wind speed means 19 minutes less in handicap to winner Charlotta! Next race is Syysseilaus on 10.9. Charlotta now passes us in the ranking. The final race will be very challenging, and Charlotta has very good chances to take the silver position. They also have a theoretical chance to fight the gold with FiftyFun. 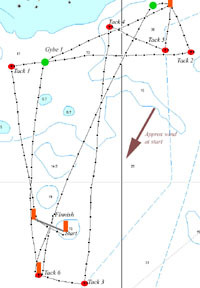 Graphs showing the handicap to be given by Tarantella to these three boats are presented here. The graphs show the time in seconds per mile we have to be faster at various wind angles and strengths. 1.9.2005 Tarantella's next challenge is Henri Lloyd Race on 3.9 arranged by HSK. 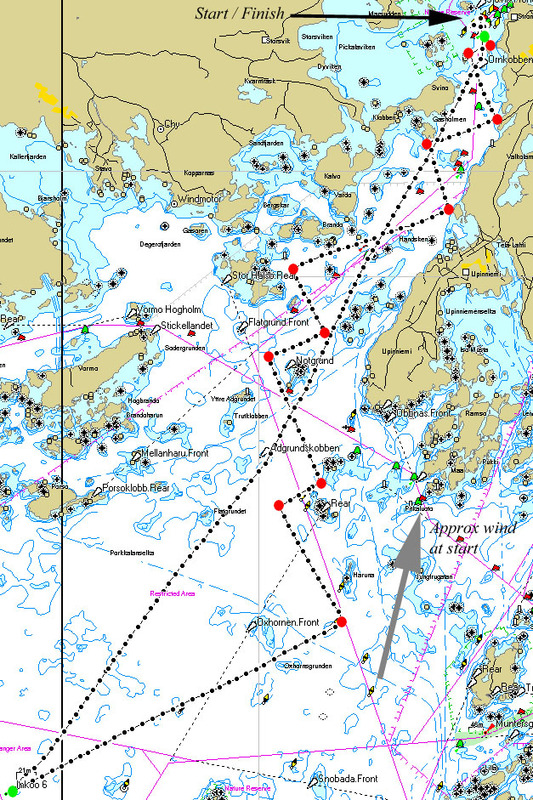 The course is a short offshore race outside Helsinki of about 26 nm. Our toughest competitors are Tom Finell's FiftyFun and Harald Hanneliu's Charlotta at least with respect to the ranking situation. 28.8.2005 The Sparkman & Stephens Association Annual Regatta was sailed according to the LYS rule in good winds and beautiful weather in the Helsinki archipelago on Sat. 27.8. Tarantella took a good start with Juhana Salminen at the helm and kept the leading position all through the race. 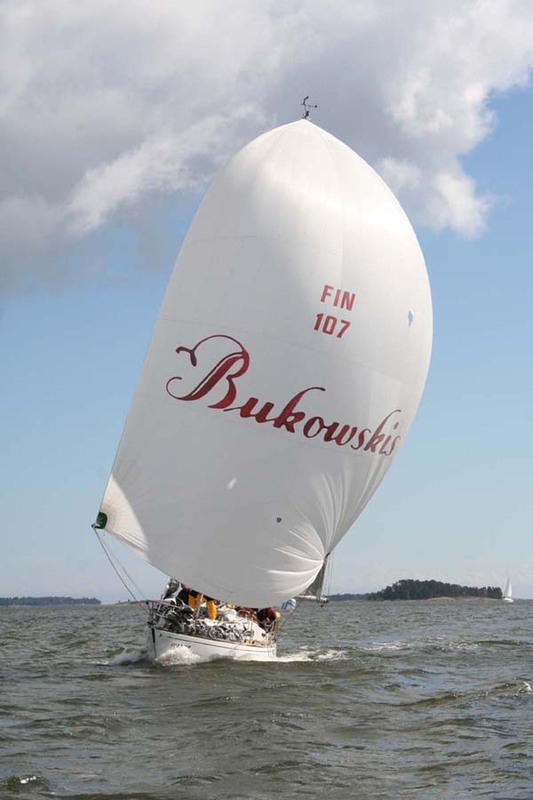 Jukka Knopp's Swan 36 Merikotka finished second and the bronze was won by Edvard Krogius' beautiful S&S yawl Ilderim. The race was tight, and only a few minutes separated the boats from each another. All boats in the race are classic yachts designed by Sparkman & Stephens and with an age of 35 - 44 years. Read more about the Sparkman & Stephens Association here. 20.8.2005 Our first victory this season is still waiting to be taken... Third place (also over all) in Helsinki-Tallinna Race with only 15 s to second place Laura and much more to winner Minnamari, who obviously sailed marvelously the course in very light winds (mostly 3- 5 knots and only during short periods up to 10 knots onboard Tarantella). It was beating against the light wind practically all the way, which is very tough for Tarantella. As previous races against Minnamari have shown, in winds below 10 kn they have the upper hand, whereas stronger gusts pave the way for Tarantella. The race took this year over 12 hours to complete. All in all the race in the ORC 2-class was all about route planning and we think we did a good job at that. Minnamari and Laura of course a notch better! Interesting fact is that only 7 boats (18 tot) in the ORC 2 where faster in elapsed time and we managed to outsail also 6 boats in the bigger ORC 1 in sailed time, even beeing the second smallest boat in the whole fleet in these wind conditions. 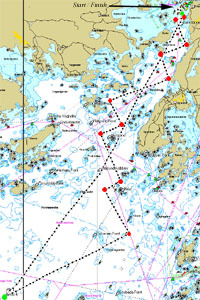 The slightly extended route, where Nygrund was rounded after Tallinn light house was a positive new experience, even though it did not give any spinnaker run this time. Full results here. Next race is the S&S Annual Regatta Sat. 27.8. 15.8.2005 Second place for Tarantella in NJK Short Course. Winner was FiftyFUN (again), with a margin of 53 seconds. The third position went to Mikko Mehtonen's Mellow Light. The race of 27 nm was sailed in light and very shifting winds. Positions changed during the beating leg many times due to wind shifts of up to 30 degrees. Charlotta, second in ranking, had probably more bad luck, and finished as fifth this time. Tarantella will climb up to second in the ranking. Results here. The picture shows the positions 10 minutes after start. From the left Mellow Light (behind helmsman), Charlotta (already quite far back), Life Style and Juanita. FiftyFUN is a few meters ahead of us thanks to a perfect start, but was soon bypassed. 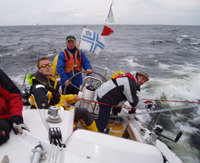 Next race is the Helsinki-Tallinna Race of 46,5 nm on 19.8. Number of participants in class ORC Club 2 is 19 boats. Next challenge for Tarantella is on 14:th August in the NJK Short Course ranking race. 29.7.2005 The second day of Offshore Week was more successful for Tarantella. Fourth place in the first round the buoys race and first place in the second race. The archipelago race of 18,4 nm went also excellent with a first place here as well. After two days total standings are: 1. FiftyFun 8,4 points, 2. Charlotta 9,2 points and 3. Tarantella 9,85 points. Everything is thus possible in the last 2-4 round the buoys races on saturday. The weather was fine and the arrangements have been very good. 28.7.2005 IMS Offshore week started with the offshore race of 104 nm in strong winds up to 15 m/s, weather that suits Tarantella especially well. We had a good and enjoyable sailing, but placed us as third with FiftyFun and Charlotta before us. Results, see here. Here we see FiftyFun riding on our backwave soon after start. More pictures coming later. 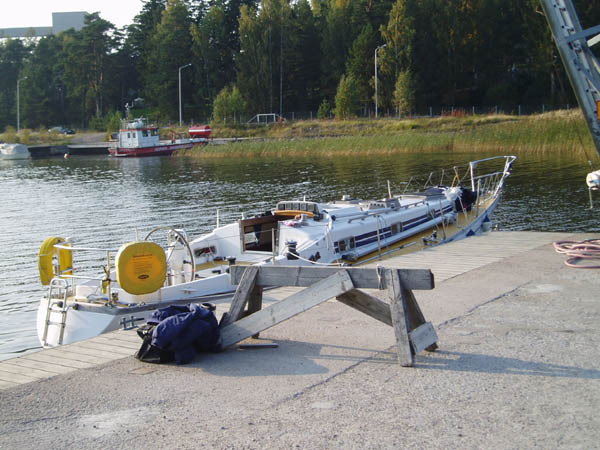 22.7.2005 Tarantella is returning home after leisure sailing in the Finnish Archipelago. We are now preparing for Offshore Week (Finnish IMS Championships) starting on 27:th of July with the offshore race part. The start is on Mellstenin selkä outside Haukilahti at 18:00. 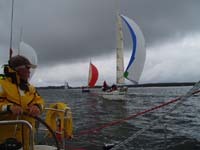 The regatta continues with an inshore course and round the buoys races on 29:th and 30:th of July. Our target is to improve our second position from last year. See more about the race and follow our achievments here. 12.6.2005 Second place for Tarantella in Espoo Suursaari Race (158 nm). 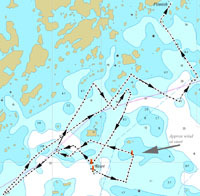 The race was sailed in good easterly winds, which meant that the boats had to beat all their way to north end of Suursaari. Tarantella had a bad start at the port buoy being pushed out by Vanessa and FiftyFUN. It took long time to recover this miss. The wind was very variable in both direction and strength, which meant that there were several chances to loose or win on the shifts. In the long run the pro's and con's equalled out and the four first boats in IMS 3 rounded Kotkan Portti within 3,5 minutes in corrected time. Tarantella was here second after FiftyFUN. From Suursaari back it was reaching and running in rather strong winds all the way (see picture above). As Kotkan Portti was rounded second time Tarantella was in the lead position with only 1,5 minutes to FiftyFUN (corrected time). We had an excellent run to Gråskärsbådan, but the increasing easterly wind up to 15 m/s brought the boats behind us surprisingly fast to the reporting point. FiftyFUN rounded 55 minutes behind us giving her a lead of 14 minutes in corrected time. Despite of hard fighting from here to the finishing line with spinnakermaneuvers in the darkness and heavy rainfall we could not reduce this lead with more than a minute. We congratulate FiftyFUN to the first place! Third was Minnamari and fourth Juanita. See results and pictures. Stories by FiftyFUN and Juanita. As you can see on the pictures, Tarantella carries the red protest flag on the back stay. The reason was that one IMS 3 boat on the way up to Suursaari in contrary to the course description passed Tiiskeri lighthouse on the wrong side. They gained conciderably on this. No protest was filed at the end. 7.6.2005 Tarantella in the first ranking race WB Sails Round the Buoys on 5.6.2005 consisting of three separate windward-leevard starts. Boat speed and maneuvers were OK, but in the first start we were to eager and got an OCS without knowing it until the results were published. First place in the second race and second in the third. This gave a total position of third place. Winner was Charlotta and second FiftyFUN. See the official results here and read the stories of Harald Hannelius and Tom Finell. Pictures are here. Next challenge is Espoo Suursaari Race on 10-12.6. 25.5.2005 Olin J. Stephens (97), founder of Sparkman & Stephens Inc. attended the S&S Association's annual general meeting in Helsinki recently. On the picture he is seen onboard one of S&S's masterpieces, the Swan 37, Tarantella, together with skipper and owner Leif and original skipper Heinz. See article in Helsingin Sanomat here (in Finnish). 16.5.2005 Follow the steps Tarantella took this year prior to launch. 1.1.2005 Main goal of 2005 is to win the Finnish Offshore Champs. Check the website at www.avomerism.fi.